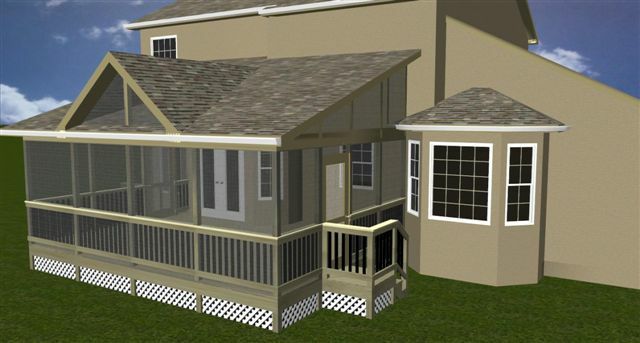 Are you trying to decide between a screened porch or a deck? 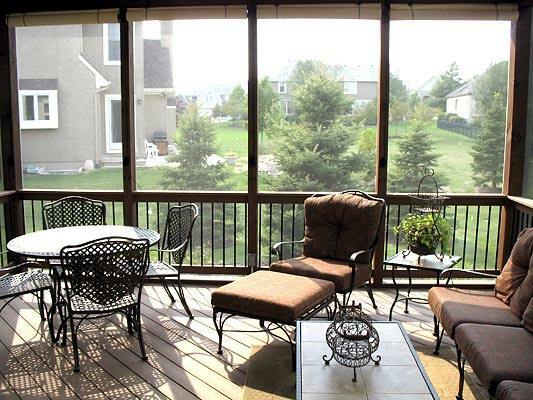 Are you looking into adding a deck or screened porch to your Kansas City area home? At Archadeck of Kansas City, building the right outdoor living project for your home and lifestyle is our goal. 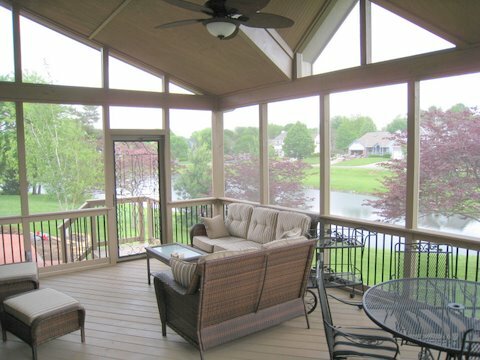 Here, we discuss the differences between the two, while showcasing one of our screened porch projects in Overland Park. Roofed enclosures are one of the biggest items we sell. There are advantages to both open decks and patios as well as roofed enclosures. Often there are just simply more advantages to roofed enclosures because there are more lifestyle objectives than can be met with a roofed enclosure. For example, relaxing on a deck is a great way to enjoy your yard and the sun while watching the kids play. But, it’s only ideal in ideal weather. Once it rains, or the sun is too strong, or the bugs come out in full force…the deck won’t be your ideal living area all hours of the day. Don’t misunderstand us. We build a whole lot of decks, and they are a great outdoor living space. It all depends on how much outdoor living time you are looking for, and what level of protection you desire from the elements. 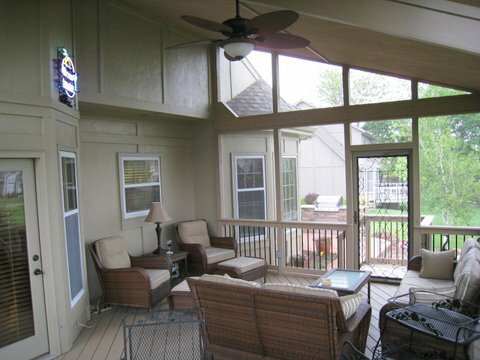 Take a look at this screened porch project in Overland Park, KS. These homeowners had a deck exposed to lots of southwest facing sun. They wanted protection from pests, and to be able to eat in their outdoor living area without the threat of pests intruding their outdoor living area. They also wanted shade, privacy, and weather protection. Kansas City screened porch design by Archadeck of Kansas City. We replaced their old deck with a new screened porch. We bumped out their old deck space several feet giving their new screened porch a very comfortable size – 17′ × 21′. The homeowners wanted a wood structure that they could paint. The porch was built using ACQ treated pine. On the exterior we used a low-maintenance smart trim which is rot resistant. Not only were we impressed by the workmanship of our new screened porch we were extra impressed by the construction crew. Thomas and Alex showed up every morning at 7:30 sharp and stayed until 5:00 until the project was complete. The worksite was cleaned and lumber restacked everyday before they went home. 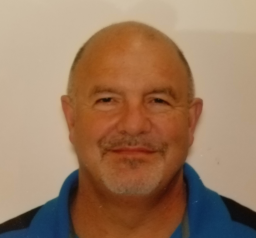 Steve Folsom was in constant communication during the project to made sure all details were to our satisfaction. The roofers, gutter installers and electrician were also helpful and easy to work with. We are very proud of our porch and it seems to be the point of interest in the neighborhood. Thank you Archadeck. Open and airy screened porch design by Archadeck of Kansas City. If you are considering adding a screened porch or deck to your Kansas City area home, give us a call for a free consultation at (913) 851-3325 or drop us an email. We look forward to working with you to design the perfect new outdoor living space for your home.